Welcome yourself to luxury living with our handmade Amish Morris Panel Bed. 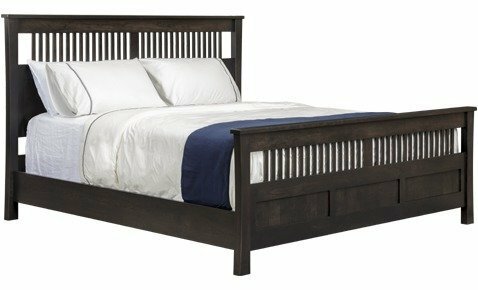 This solid wood bed is available in five different bed sizes for your convenience. Crafted to last a lifetime in the hand selected wood of your choice, your new Amish bed will be something special! Enjoy endless nights of sound sleep in your new heirloom quality bed. Amish made in America, your solid wood bed will be handcrafted to perfection. Check out some of your options in the "Select Options" menu. Add on a motion activated bed light to prevent you from tripping over something on the floor in the dark or consider personalizing this Amish bed with your name crafted on it. Give one of our Amish Furniture Specialists a call today if you have questions or concerns about this bed or any of our other products. Our toll free number is 866-272-6773 and our email address is Questions@DutchCrafters.com.